← Sixty Six Days Later – Market Basket is Back! I don’t know if I’ve ever told you this or not, but I love to read diaries. You just can’t get better up-close-and-personal information about people than in diaries. One of my all-time favourite diaries has been the Diary of Samuel Pepys. Have you ever wondered who Samuel Pepys really was? Or, if you knew who he was, have you ever wanted to read his famous “Diary of Samuel Pepys” but were afraid to start, or weren’t sure where to start? Summary of Samuel Pepys and his now famous diary, to get you up to speed. A handy Archive of the Diary for easy reference. So now’s the time, if you’ve ever wanted to know just what was so fascinating about this 17th century diarist. “Samuel Pepys was born in London on 23 February 1633, the fifth of eleven children, although by the time he was seven only three of his siblings, all younger, had survived. He was sent to grammar school at Huntingdon during the English Civil War (1642-1651), returning later to London and attending St Paul’s School. “Pepys begins his diary at a crucial point in Britain’s history. 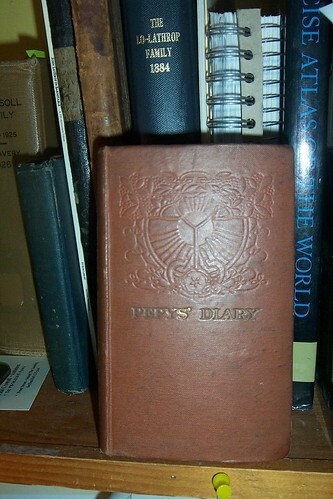 I actually have in my possession two copies of Pepys’ Diary, one is a modern edition which is quite large containing several volumes and takes up a good amount of shelf space, and the other version I have is a very, very old, very tiny version that I bought in England from an antiquarian bookseller there. It’s very difficult to read that older copy, it falls apart in your hands when you try turning the pages, so I haven’t actually read much from that particular version; see photo below – it’s only about 4-1/2 inches high! This on-line version wherein the author of the site posts an entry a day is a good way to read this classic diary. And Pepys was a first hand witness to the Great Fire of London and writes about it in his diary – a cracking section there. Another very useful feature of this online Diary is that every so often, the author has highlighted words/phrases which, when hovered over by your cursor, will illuminate a little tid-bit of information just FYI – to keep you filled in on all the interesting details. Very well done! You can click on “In-Depth Articles” (use the little 3-bar icon at the top header in the bottom right corner of it) and find this Article about the Great London Fire of September 1666. Actual entries about the Great Fire. So, go ahead and have some historical fun! And you’d better leave a cracker-crumb trail as you go because you might not be able to find your way out again, once you’ve entered into the World of Samuel Pepys! I have some of his books…one old I got when in England. Love how he writes about day to day stuff…even if he did a potty sometimes.